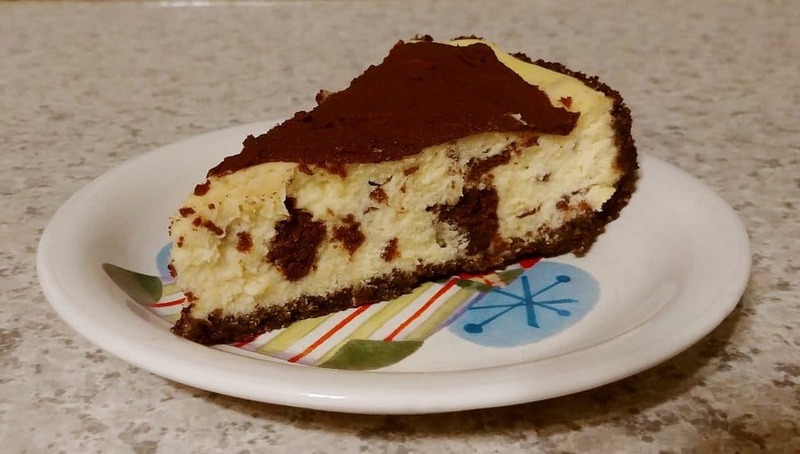 I rediscovered this brownie cheesecake when I was going through my recipes to make something for Alex’s birthday (ultimately, a chocolate caramel cheesecake) a few months ago. I honestly don’t remember when I first made this – it could have been years ago, could have been several months – but I wanted an opportunity to make it again. So when I recently made some brownies that I really wasn’t that wowed by, a full 9×13 inch pan of (perfectly-fine-but-not-up-to-Leo-standards) brownies, I cut some into 1-inch bites and stashed them in the freezer to wait for my next cheesecake opportunity. Last week was the right opportunity. I made this cheesecake to take to a local MOMS club event, where three-quarters of it promptly disappeared. And believe it or not, I’m not always a huge cheesecake fan, but I found myself taking the last piece of brownie cheesecake, that I’d planned to share with Alex, out of the fridge and eating the whole thing myself. This is a creamy, not-too-rich, not-too-sweet cheesecake. The recipe is largely from Smitten Kitchen; she adapted cheesecake batter from this recipe. I love it. The cheesecake batter itself takes just four ingredients (and only 3 packages of cream cheese, a far cry from the 5 that my first cheesecake recipe called for 20 years ago). The cake only bakes 45 minutes in the oven (although it still takes hours to chill in the fridge, of course). I also love the crust recipe. It yields plenty of crumbs, which makes it easy to pat into the edges and up the sides lightly. Since it’s not dense, it’s easy to cut through the crust with my fork. I considered no topping, but I used one because my cheesecake had a slight crack. I melted chocolate chips with a little milk for the topping shown in these pictures, but the chocolate was a little brittle when cold. I’ve included the ganache from the Chocolate Stout Cake in my recipe, which should cover the cheesecake about as pictured. Increase it by half (as listed below) to cover the entire top to the edges. 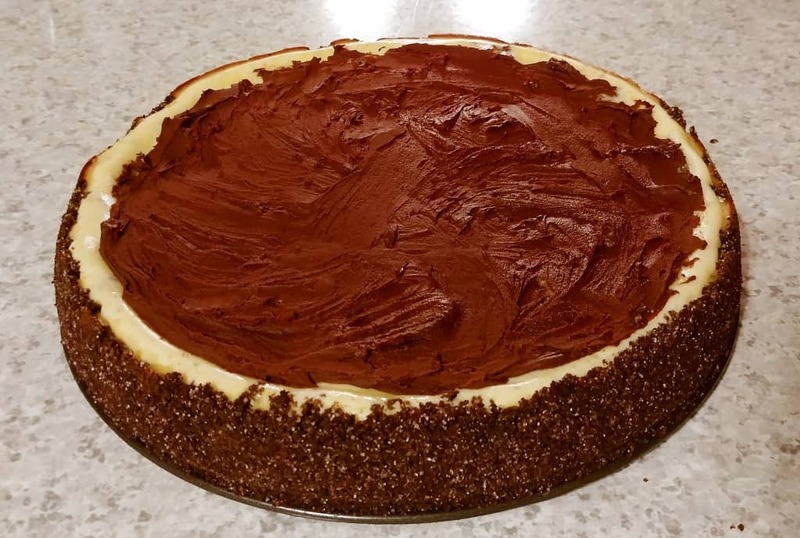 Since this isn’t a tall cheesecake, you can use either a 9-inch or a 10-inch pan if you don’t have 9.5-inch, adjusting the baking time as necessary. I’ve always used lighter Neufchatel cheese instead of cream cheese in cheesecake, with complete success. For the crust, I weigh out chocolate animal crackers, which I always have because I have a preschooler. 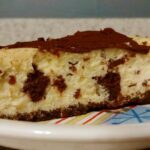 I’ve made this brownie cheesecake with leftover Fudge Brownies, and a recipe similar to Hershey’s Best Brownies. However, you can use your favorite brownies here. (The Fudge Brownies were particularly good – the brownie bites were more fudge than brownie when cold!) It’s easiest to save leftover brownies rather than make them special for this recipe. 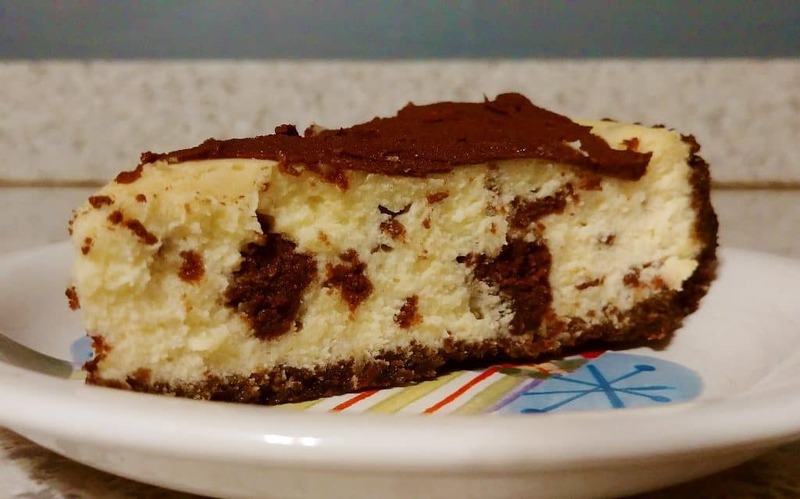 Simply cut leftover brownies into bite-size squares, slide them into a freezer bag, and stash them away to make this cheesecake. Bring them back to room temperature before you make the cheesecake. Here’s some tricks to making cheesecake. Have your cream cheese at room temperature; I pull mine out when I get up in the morning if I plan to make it midmorning. That will minimize lumps. Then beat your cream cheese well to make sure it’s creamy and smooth. Mix in remaining ingredients on low speed, and only as long as necessary; you don’t want to beat in much air. I haven’t used a water bath, which some people say to use to prevent cracks. I do try to cool the cheesecake in the oven with the door cracked open for about an hour to prevent cracks in the cheesecake. (I only did about 30 minutes for this one, so it cracked.) Luckily, if cracks happen, you can just slather on a topping to hide it and no one’s the wiser. Make crust: Grind animal crackers in food processor if you haven't already. Add melted butter, sugar, and salt and process until well combined. (You can also mix this together in a bowl if you already have crumbs.) Pat along the bottom and press 1 inch up the sides of a greased 24-centimeter (9.5-inch) Springform pan with 3-inch sides. Set aside. Make cheesecake. Beat cream cheese with an electric mixer until creamy. Add eggs, 1 at a time, and then vanilla and sugar, beating until just combined. Gently fold in brownie bites with a rubber spatula. Pour into the crust. Place pan on top of another baking sheet (to minimize drips) and bake at 350F for 45 minutes, until the cake is set 3 inches from the edge but still wobbly and damp looking in the center. Cool in the oven with the door cracked for about an hour (to try to avoid cracks on the top of the cheesecake), then place in the fridge. Make ganache: place chocolate chips and cream in a microwave safe bowl. Microwave in 15-second bursts, stirring after each one, until chocolate is melted and smooth. Spread over cheesecake, then refrigerate for 30 minutes, until ganache is set.